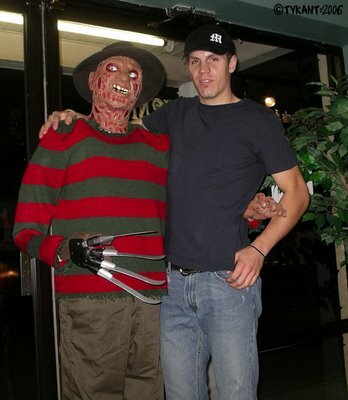 Happy Helloween to all the ghouls and goblins out there from the TYRANT crew. 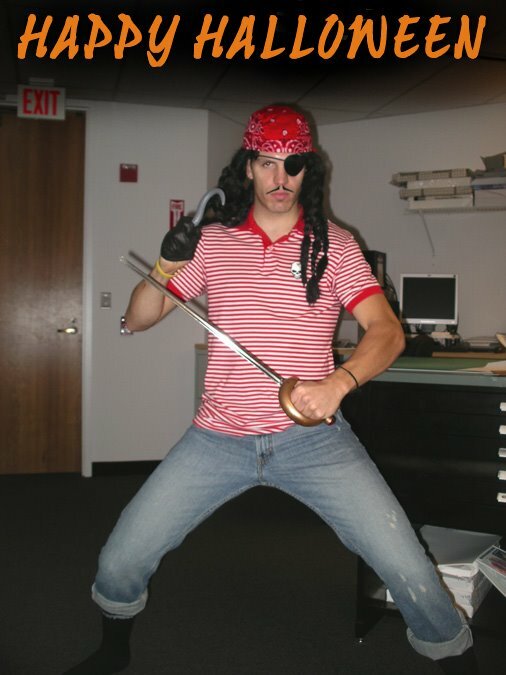 You ain't no Jack Sparrow! Thanks again to all of you that made it out to the TYRANT / HEBRANK Art Show tonight. The show was a major success with Shawn selling all but 2 of his pieces and myself selling 4 of the 10 I presented at the show. The fact of the matter is that the show wasn't about selling art or making money. 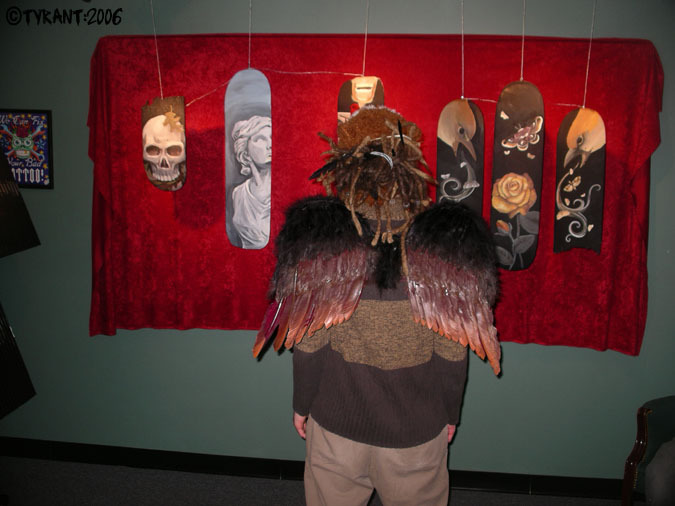 The show was about both Shawn and I's love for creativity and originality. So a crew on us met up at the Clinton Park for a night session under the lights. I was so suprised when we got to the park, there were only 10 kids there....that was a first!!! Usually the place is infested, but I guess kids hate the cold. Anyway, it was a good session and as usual people were going off. Don Pavelka was 360 whipping like it was his job, Ashley Crabb rose from the dead and threw down some radness including a few backflips, Arwine did the smallest wallride ever like 6 feet back out a quarter, and Garrett Pyskaty was fine tuning his tail whipping skills. All in all it was a fun time...minus the low 40 degree temperatures!!! Check out the madness at TYRANT'S Photos. As always, thanks for scoping out the blog! Tiny Tyrant with a lawnmower. 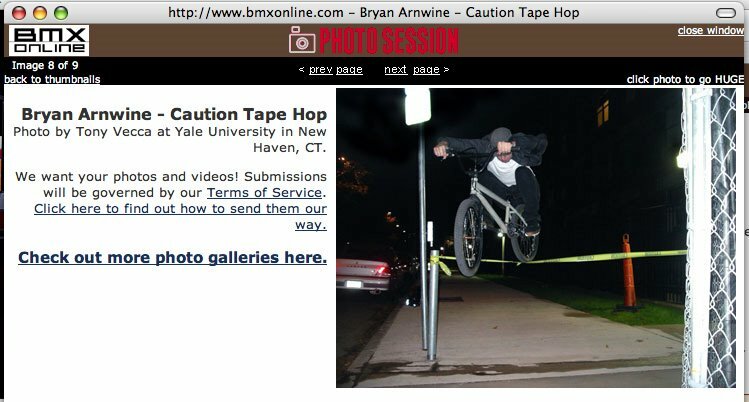 So I was stoked today to find out that one of my photos of Bryan Arnwine from our Yale street riding session last week made it up on BMXonline.com. 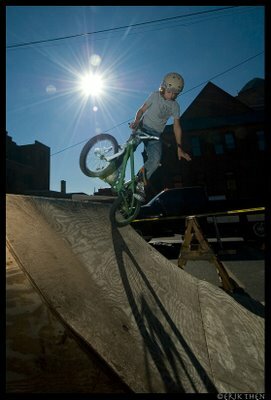 For those of you who don't know the site is run by Ride BMX Magazine and 8 photos from around the country are chosen daily. 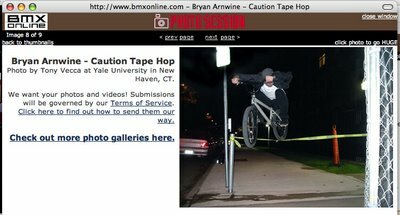 I'm psyched my photo got picked and Bry got recognized. Check it out at BMXonline.com under "Readers Photos: October 24th". For the 3rd year in a row the Pedal Power Stunt Show was a total success! Many thanks to Gary and Bill at Pedal Power for letting us put on the show again. I'd also like to thank our sponsors: TIP Plus BMX, Primo, Giant, MOSH, Maxxis, MotorTabs, TYRANT BMX, and Ghostship Clothing. Props to all the riders who came out to shred, Steve Begin for all his hard work helping get the course built, and all the loyal fans that came to watch the madness! The riders this year were going off! Everyone was feeding off one another and some huge stuff went down. 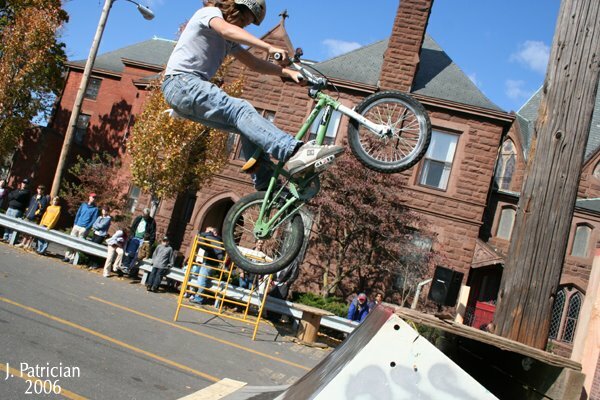 Among the highlights were Team USA rider Bryan Yezierski and Tom Ligin's amazing trials riding, Don Pavelka's tailwhip transfer over the 8 foot quarter to quarter gap, Aaron Tauscher's telephone pole wallslap, 12 year old Brandon Begin's no handed fakie air, and Josh LaRosa's crazy flatland links. Go to Tyrant's Flickr to see all of Jason's rad photos! 12 year old "Tiny Tyrant" Brandon Begin blasting a fakie air on his 16 inch bike! I totally overlooked the fact that Monday, October 16th was the 1 year anniversary of my horrible bike crash. Missing teeth, a dozen stitches, my 6th concussion and road rash everywhere...and I had my helmet on! It was a mess! I can't imagine what I would have looked like without it! Anyway, after 4 surgeries and about $5,700 in cosmetic oral suregery (which insurance doesn't cover!!!) I'm back to normal...or as normal as I'm going to get. 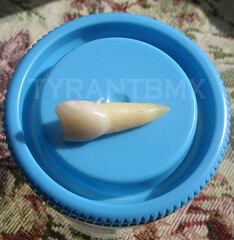 The only tooth that came out in 1 piece. NASTY!!! 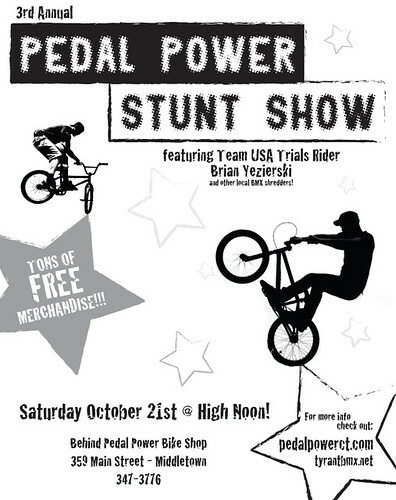 This is your last reminder that the 3rd Annual Pedal Power Stunt Show is this weekend. Come out and check out the madness! Among the riders will be the boy wonder "Tiny Tyrant" Brandon B. This 12 year old kid is nasty! Don Pavelka, Bryan Arnwine, Josh LaRosa, Aaron Tauscher and Garrett Pyz. (as seen in the TYRANT photo galleries) will also be riding and going off! So Bry. Arnwine and I headed down to mingle with the YALEians and ride the campus...and a little bit of downtown New Haven. The session was pretty solid and as usual Arnwine was tearing apart everything in his path! 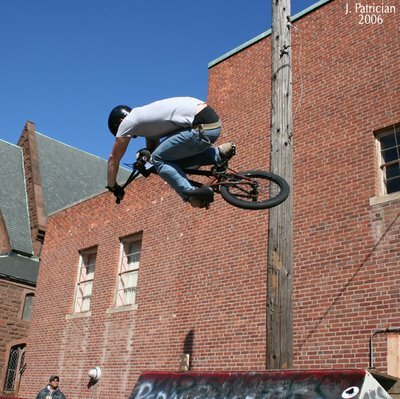 Monster wallrides pedaling 20 mph dodging 4 lanes of traffic, marathon length manuals, and some dialed fufanus! The session ended quickly when we were forced to be on our way by the YALE "boys in blue". You know....cause BMXers are such a threat to society, but the drugs dealers and thugs roaming around the campus are harmless!!! SO LAME!!! 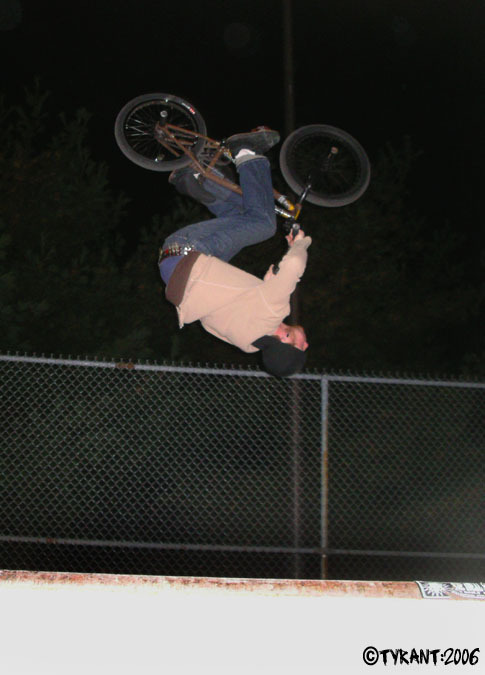 Anyway, check out the rad pics at Tyrant's Photos on Flickr and the video below. As always thanks for checking out the blog and supporting TYRANT! The photo does it no justice! 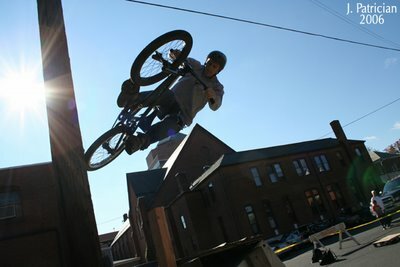 The bank up to the wallride is at least 12 feet tall!!! 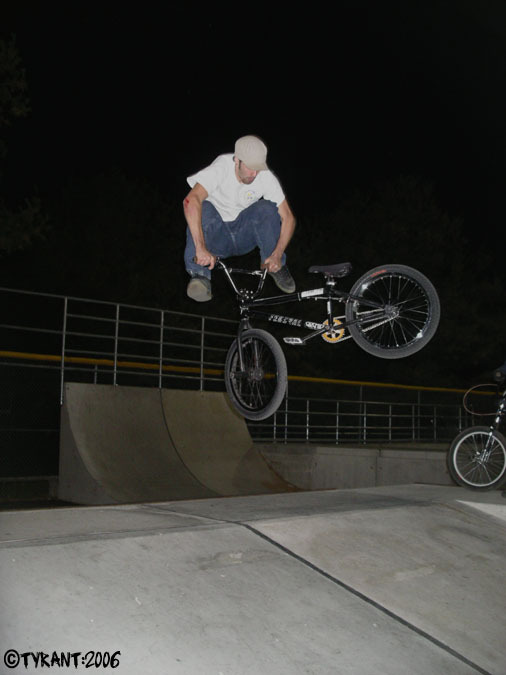 Inner guardrail icepick. Photo by Arnwine. Arwine's marathon length manual late night! So it was a great showing by the CCNS / Pedal Power team in the Mens Cat 5 race at the Jamestown Classic Road Race today. Although the team will not be official till nex year, we try like hell to represent and get the name out there! Bob German and I finished 3rd and 4th respectively in one of the gnarliest race finishes I have ever been part of!!! The final half mile was fast downhill with a mellow right turn and a viscious hard left that spit you into a 100 meter sprint to the finish going over 40 mph!!! It was a 5 man battle to the line and we all ended up fractions of a second apart. CCNS / Pedal Power got a nice plug with the 2 of us side by side at the awards ceremony sporting the team jersey. We also walked away with a small wad of prize money each, a t-shirt, and some other random swag. All in all it was a great way to end the 2006 racing season and a great showing for Aidan (CCNS) who has been training Bob and I since late spring. Now we have the 2007 season to look forward to....which will bring our official racing team, official sponsors, team apparel, and a winning attitude! OK, I have a ton of t-shirts in stock that I need to move to help pay for the insanely rad new stuff thats on order. You can message me via MySpace or e-mail me via TYRANT to place an order. The easiest thing to do is meet up with me somewhere and buy direct. Buying direct from me also gets you stickers, a limited editions 8 x 10 print of the TYRANT poster (designed by Shawn Hebrank), Shawn Herbank stickers (and poster for some extra $$$), and FREE CANDY!!! So come and get some!!! In other news, I should have the "I heart TYRANT" shirts done by late next week. They will be for sale at the Pedal Power Stunt Show on October 21st or the TYRANT / HEBRANK Art Show on October 30th. I will have t-shirts ($10), Hoodies ($20), and the "Bum Beanies" ($8). The new stuff is hott!!! The beanies are sick!! !